Our first competitive stage rally. Things started slow for us. We finished 7th in class on the first stage, second to last in class, navigating slowly through the snowy Crane Creek stage. We were even passed on stage by Michel Hoche-Mong. We slowly increased the pace until stage 5 when we had our first off. A bit too peppy into a medium right, Tom took evasive action and avoided some small trees to plant the car on a little hill of dirt. We were stuck. I got out and basically hauled the car off it's perch so we could finish the stage. We probably lost about 6 minutes in the weeds. After surviving that, day 2 was we found our legs. We finished 6th and 7th overall on Blue Slough, the tarmac stage, and then proceeded to win our class for almost all of the last 6 stages. On our first visit to the famous Brooklyn Stage, we ran an 8:06 and shaved it down to 7:49 on the second run. After finishing 5th in class on day 1 and 1st in class on day 2, we ended up finishing 2nd in class for the series and 21st out of 40 overall. We also won the Novice class! While the results were good, we also got to experience the rally culture that would keep us hooked for years. 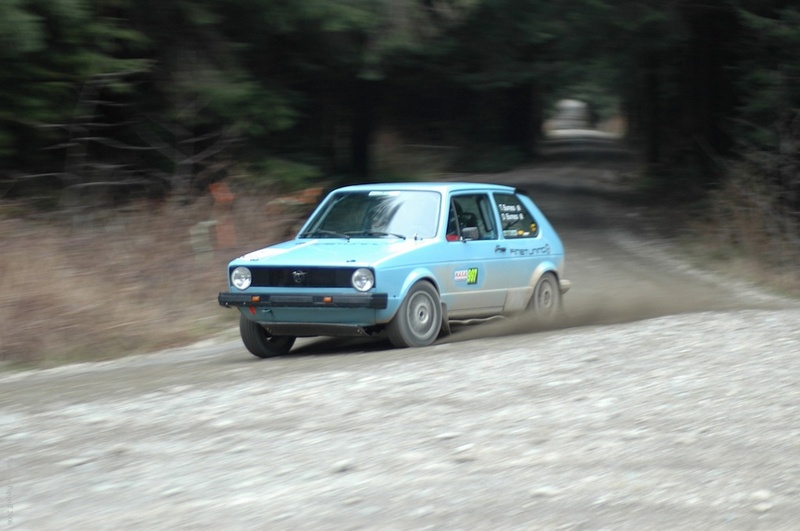 Two VW compatriots rolled their cars (most notably, Derek Bottles, who was one of the fastest in the PNW). Our service guys bought airsoft guns. I almost loaned the transmission out of my daily driver to a VW rallyist from California. We ate at the Oakville Grange for the first time. We formed friendly rivalries with Adam Crane, Nate Tennis, and Cody Crane. We came in 2nd in the series to the driver whose car we would later buy. We met most of our extended rally family. And we keep coming back for more.